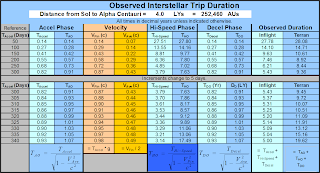 Previous problem analyzed only one insterstellar flight profile, a 4 Light Year (LY) trip to Alpha Centauri (AC) with acceleration time = 300 days = deceleration time and a fairly lengthy High Speed Phase between acceleration and deceleration. We can adjust that flight profile by adjusting initial acceleration time which will determine values of other parameters. Of course, simulated gravity (aka "g-force") is maintained during acceleration/deceleration phases by maintinaing constant velocity change of 10m/s for every second (approximates free fall rate of objects near Earth's surface). It's very likely that interstellar flights will have to operate major portions of their time/distance without expending exhaust particles; thus, we've proposed a "High Speed Phase" which will likely transpire over the vast majority of the trip duration between stars. To maintain g-force throughout this portion of flight, vehicle will have to change inflight configuration to rotate the cylindrical vessel so that contents on inside of outer hull will feel a centrifugal force equal to being accelerated at 10m/s/s. This problem uses tables to examine multiple flight profiles. Each row of the following table represents a separate flight profile with a different duration of the acceleration distance. Table 1 examines lower range of acceleration durations; Table 2 focuses on a smaller range at top end of acceleration durations; Table 3 analyzes time dilation effects on both ranges. Distance from Sol to Alpha Centauri = 4.0 LYs = 252,460 AUs. Previous problem describes calculations in detail; so, following items will breifly describe contents of above table. Three phases of each flight profile (Acceleration, High Speed, Deceleration) each have two columns, Time and Distance. Accel Phase. Time column contains "independent" variable because flight planners and operators can independently choose this quantity based on ship's capability; thus, all other table values "depend" on the time chosen to accelerate. If ship has the fuel and the propulsion system to continuously operate for the maximum value; then, it makes a lot of sense to accelerate to the maximum and considerably shorten the trip. For example, if ship can accelerate for 300 days and make the entire trip in 5.43 years, then, it makes little sense to accelerate to only 50 days and take almost 28 years. Of course, the table lists the alternate profiles (table rows), because it's very likely that initial interstellar missions will have to choose less ambitious profiles because like any technology, starship capability will have to start small then progress up a learning curve. Hopefully, these initial ships will be entirely roboticized because 27.78 years is a long time for an one way trip. Distance column of Accel Phase shows Astronomical Units (AUs) traveled. These values are easily calculated by multiplying Acceleration Time (previous column) times VAve, average velocity attained during acceleration phase. Velocity. There are two velocity columns. Final Velocity (VFin) is achieved at the very end of acceleration phase. Average velocity is the velocity which could be determined by adding all the velocities throughout the acceleration phase and then dividing by the number of velocities acheived. Since initial velocity is usually zero, VAve usually equals half of VFin. Final velocity (VFin) is very easy to determine, just multiply acceleration time (TA) times rate of acceleration. Recall that acceleration is chosen to impact g-force to human occupants. For convenience, we've chosen the value, 10 m/s/s, which is very close to the more accurate 9.8 m/s/s experienced by freely falling objects near the Earth's surface. After some easy conversions, we determine that 10m/s/s/ closely approximates .5 AU/dy/dy; this is an more convenient value because it's easier to express space voyage durations in days versus seconds. Thus, after 1 day of accelerating at .5 AU/dy/dy, we've achieved a speed of .5 AU/dy. Similarly, after 100 days, we've achieved 50 AUs/day and so on. Since we achieve final velocity at the very end of Accel Phase and we maintain it until we start the Decel Phase, we can use Final Velocity throughout the Hi Speed Phase. Average Velocity. We must not use final velocity to determine distance traveled during Accel and Decel Phases, because velocity changes throughout these phases. To determine distance traveled during these phases, we must determine average velocity (in the VAve col.). Since acceleration is consistent and initial velocity was zero, this is easily done by taking one half of the final velocity for that row. Table 2 is similiar to Table 1. Exceptions are noted below. Accel Phase. Time column still contains "independent" variable except the increments are no longer 50 days; they've been reduced to 5 days per row. We'll see later that accelerating more then 340 days brings us very close to light speed; thus, we've arbitrarily decided to cap the acceleration range at 340 days. Velocities. VFin and VAve are determined in same way as for Table 1. However, they are expressed as a decimal fraction of c, light speed. Recall that c = 172.8 AU/day. Note that after accelerating for 340 days, VFin equals .98c. This presents a dilemma because all we need to continue accelerating is more fuel; so, there's no reason the spaceship can't accelerate for many more days. On the other had, simple arithmetic calculations will soon yield velocities in excess of 100% of light speed, which is impossible. Thus, we'll arbitrarity pick 340 days as the maximum number of days for straight acceleration at g. First, we must obviously use a relativistic equation to proceed further. 2nd, further discussion will show benefit cost ratio is not good at 340 days and gets even worse if we accelerate longer. High Speed Phase Time and distance values are computed in same manner as described for Table 1. However, Table 2 uses different dimensions, decimal years and LYs. Decel Phase values continue to equal corresponding values in Accel Phase. (Applying g-force in both phases, it takes same time and distance to slow down as it does to speed up.) For contrast and utillity, times are are in decimal years and distances in LYs. Above table (click on it for better view) quantifies the time dilation effect to contrast elapsed times as experienced on by onboard traveler and off board observer. Arbitrarily increase duration of acceleration phase according to total voyage distance. In this case, increase duration 3% past 360 days for every LY of distance from Sol to dest. *Cruise time computed as Earth Observed.